This is a rather late weekend update, but I just couldn't get these photos processed in a timely manner. 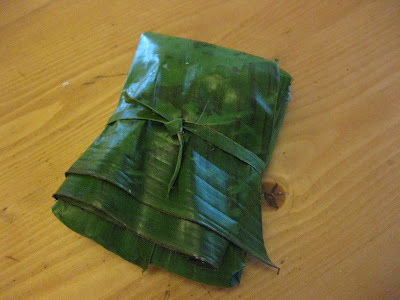 So, in the spirit of better late than never, here is a glimpse of last weekend's time consuming cooking project-- red molé pork tamales in banana leaves. As I've mentioned, my mom just came back from Oaxaca City. She usually carries pre-made packages of molé with her, which we hoard for special occasions in our freezer, because nothing can match molé from the source. Unfortunately this year her molé was taken from her at the airport (she didn't check her bag, grr), because the security personnel considered it a liquid/cream. Another guard argued with the first, but alas, the molé was seized. So, back in the states with no molé we ventured out to our local Mexican giant super-market, Pro's Ranch Market. They sell green and red molé in cubes at one of their deli counters. 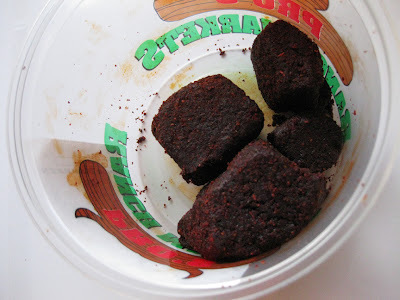 Below is their red molé. It was definitely different than the black molé that Mom would have brought us from Oaxaca, but it turned out to be delicious. I talked about how I prepare the sauce before cooking the meat in it, here in a comment response to Maggie. After sautéing the onions I definitely mixed the paste into the dry pan and let it cook for a few minutes to darken it up, stirring constantly, before adding broth. In this case I was using thick cut pork chops as the meat, and I had browned them in the pan and then put them aside and used their fat to make the sauce. Adding the browned meat back in, it simmered on the stove top for an hour or so, until the meat was tender enough that it would shred like I wanted it to. I used this cazuela that my mom had bought on a previous trip to Mexico. Its a very light weight pottery, but it cooked everything beautifully. I hadn't used it before, but I liked it. I'll definitely use it more often. 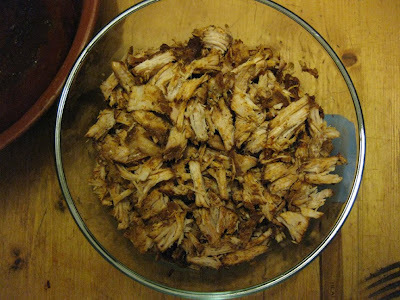 Once the meat was cooked and shredded I poured the sauce over it and refrigerated it over night. That was just a time saving measure because we were going to make the tamales on Sunday morning, and I wanted to minimize the prep time. 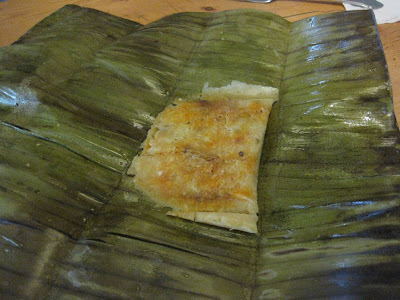 Molé tamales often have a banana leaf wrapper instead of corn husk. 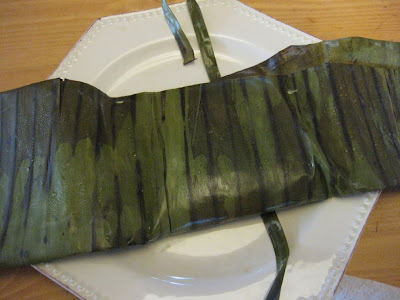 The banana leaf adds a different flavor to the tamale that goes well with the rich sauce. We bought ours at Pro's Market. 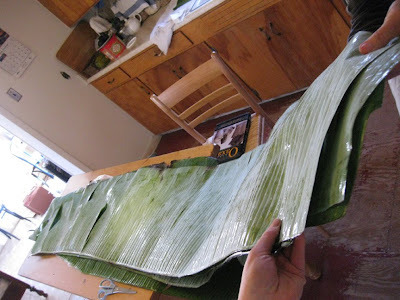 As you can see, banana leaves are huge! 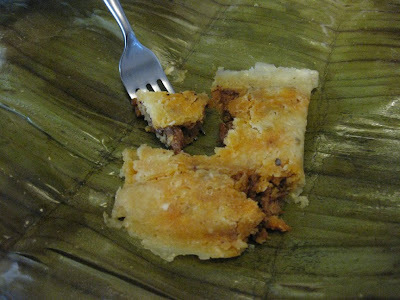 They tear really easily though along those ribs, so its easy to get the small size that you need to wrap the tamales. They smelled so fresh, like green bananas, I wish the internet could capture smell. 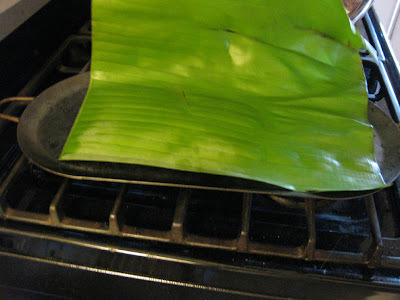 The leaf has to be heated over a flame or steamed to soften it so that its flexible enough to wrap the tamale. 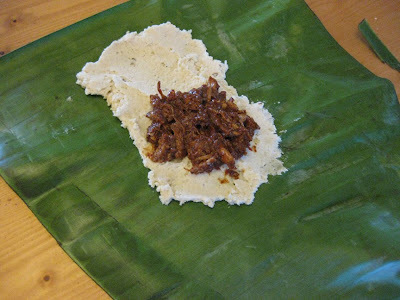 We used a pre-made masa, the corn dough, bought at Pro's Market. 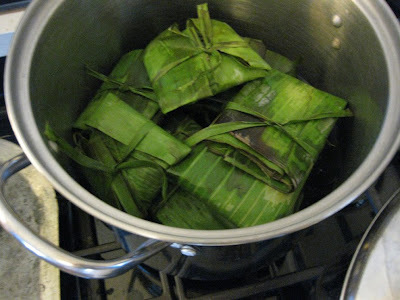 Then the tamales are cooked over steam for 45 minutes to an hour. And the best part, they taste divine! We made about two dozen, ate a few, and then froze them in packages of four tamales, to enjoy on weekends over the next couple months along with some champurrado. Wow that looks amazingly delicious! Great blog. I am really enjoying A Homemade Life. I love to cook and I really like her perspective on food and cooking. I will definately check out the podcast. Especially the one on eggs, I am a little bit of a dunce at eggs, I don't know why. I would call myself an intermediate to advanced HOME cook. Honestly, how hard is this? Where in the grocery store did you find the masa? I want to make these!! Its not that hard, just time consuming because of all the steps. And you can assume that there will be a learning curve regarding how thick or thin to spread the masa-- so some of your first ones might be a little uglier than the later one--they'll all taste good though! 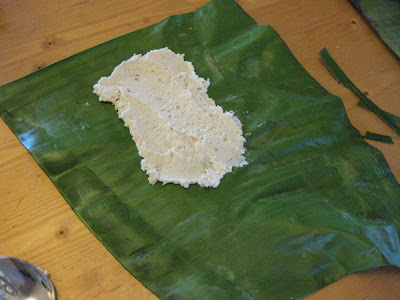 I got the pre-made masa, the banana leaves and the molé at a store called Pro's Ranch Market-- which is a chain only found in the SW states and California. In the Chicago area I'd try any of the larger Mexican markets for pre-made masa. You can mix your own masa if you can't find pre-made, but that will complicate things a lot more because it has to be a certain consistency. Also, if you have any like minded friends or family members its good to make a little party out of it. That way you can make a lot at a time and form an assembly line. 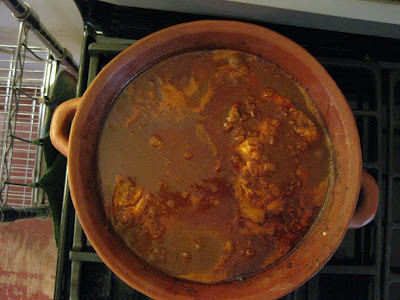 This batch made used about 4.5 pounds of masa, maybe 2 pounds of pork, and 1/2 to 3/4 cup of molé paste (plus a small onion chopped, a can of diced tomatoes, and 3 to 4 cups of chicken broth for the sauce), and it ended up making about 2 dozen tamales. I made the pork & molé the night before and it would be fine sitting in the frig for a couple of days.